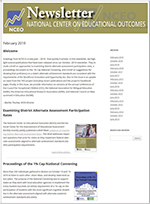 NCEO’s e-newsletter highlights NCEO’s recent publications, activities, and new and ongoing research findings. Video on calculating disproportionality in student group participation in the alternate assessment based on alternate academic achievement standards (AA-AAAS). Sheryl Lazarus and Kathy Strunk (NCEO) presented at the Council for Exceptional Children’s (CEC) annual conference in Indianapolis, IN. Yi-Chen Wu and Martha Thurlow presented at the National Association for Bilingual Education (NABE) Conference in Orlando, Florida. In March, Martha Thurlow, Darrell Peterson, and Erik Larson (NCEO) presented on the online professional development modules developed for the DIAMOND project at the annual conference of the National Association for Bilingual Education in Orlando, Florida. Percentages of 8th grade students with disabilities who received accommodations in reading and math differ in some states but not in others. In states where they differ, typically more students receive accommodations in math than in reading. Adapted from “2015-2016 APR snapshot #17: Students in special education receiving assessment accommodations” by Y.-C. Wu, & M. L. Thurlow (2018). An online interactive series of reports that puts the power of data in your hands. View and compare data, and read reports driven by current assessment and policy data.